The price of silver this week took a tumble, falling below $18 for the first time since 2010. On the week, spot silver prices per ounce fell to $17.50 for a 1.6% drop at yesterday's close (Thursday). On the month, prices are down 10.1%, and 10.6% on the year. Silver futures contracts – which promise the delivery of silver at a future date – closed yesterday at $17.44 an ounce, down 2.2% on the week, and 10.5% on the month. Other silver investments slumped as well. Exchange-traded funds backed by physical silver bullion, such as the iShares Silver Trust (NYSE Arca: SLV) closed at $16.83 a share yesterday, its lowest level since March 2010. It has fallen 10% on the year. The ETFS Physical Silver Shares (NYSE Arca: SIVR) suffered a similar fate. It closed yesterday at $17.27, good for a 10% drop on the year as well, and nearing a level not seen since early 2010. These troubles in the silver market have been brewing since July, when after hitting a three-month peak of $21.445 an ounce, the bears began to pile on short positions and put downward pressure on the white metal. Since hitting that peak in July, prices have fallen 18.4%. 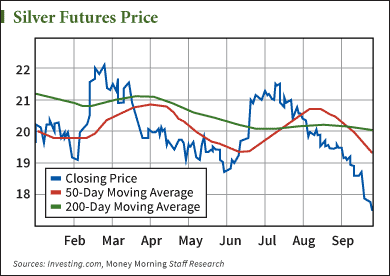 The recent silver price slump even pushed the 50-day moving average below the 200-day moving average on Sept. 5. This so-called "death cross" signifies a more entrenched bear session. The last time silver hit the death cross was back on Feb. 10, 2013, when silver closed at $31.435. The 50-day moving average stayed below the 200-day moving average for 443 trading days and silver lost 35.3%.